Viscount Melville Sound is an arm of the Arctic Ocean in Kitikmeot, Nunavut, Canada. Forming part of the Parry Channel, it separates Victoria Island and Prince of Wales Island from the Queen Elizabeth Islands. East of the sound, via Barrow Strait, lies Lancaster Sound, leading into Baffin Bay; westward lies the McClure Strait and the Arctic Ocean/Beaufort Sea. The sound is a part of the Northwest Passage. The Wellington Channel is a natural waterway through the central Canadian Arctic Archipelago in Qikiqtaaluk Region, Nunavut. It runs north/south, separating Cornwallis Island and Devon Island. In 1845 Sir John Franklin wintered at Beechey Island at its southeast end. In 1850 2 ships were caught in the ice. In the spring of 1851 it was explored by William Penny who went by sledge to the northwest tip of Devon Island. Edward Belcher explored it in 1852. 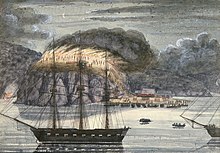 Breadalbane was a British three-masted barque, a mid-19th century merchant ship that was crushed by ice and sank in the Arctic. Vice-Admiral William John Samuel Pullen was a Royal Navy officer who was the first European to sail along the north coast of Alaska from the Bering Strait to the Mackenzie River in Canada. His 1849 journey was one of the many unsuccessful expeditions to rescue Sir John Franklin and explore the Northwest Passage.